Figure 5-22. 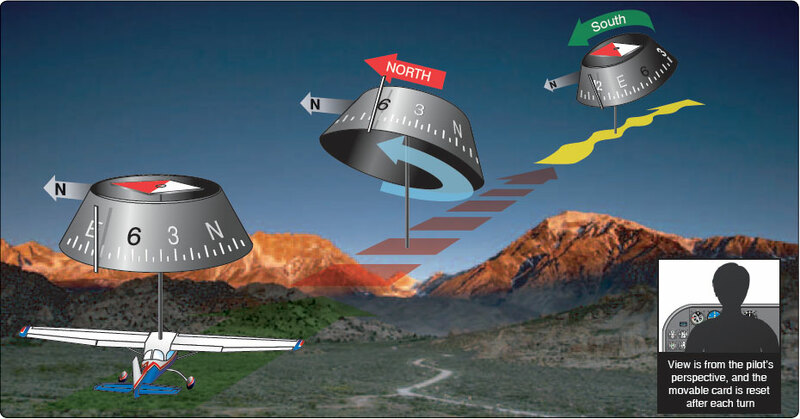 Vertical card magnetic compass. As mentioned earlier, the lines of flux in the Earth’s magnetic field have two basic characteristics: a magnet aligns with these lines, and an electrical current is induced, or generated, in any wire crossed by them. The flux gate compass that drives slaved gyros uses the characteristic of current induction. 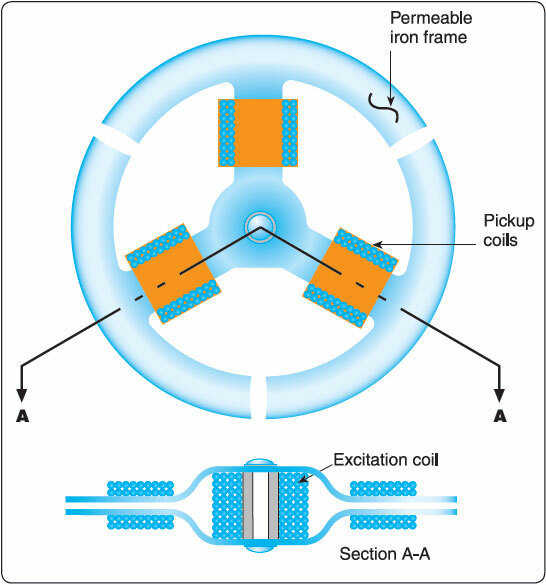 The flux valve is a small, segmented ring, like the one in Figure 5-23, made of soft iron that readily accepts lines of magnetic flux. An electrical coil is wound around each of the three legs to accept the current induced in this ring by the Earth’s magnetic field. A coil wound around the iron spacer in the center of the frame has 400-Hz alternating current (A.C.) flowing through it. During the times when this current reaches its peak, twice during each cycle, there is so much magnetism produced by this coil that the frame cannot accept the lines of flux from the Earth’s field. Figure 5-23. The soft iron frame of the flux valve accepts the flux from the Earth’s magnetic field each time the current in the center coil reverses. This flux causes current to flow in the three pickup coils. with the heading of the aircraft. The three coils are connected to three similar but smaller coils in a synchro inside the instrument case. The synchro rotates the dial of a radio magnetic indicator (RMI) or a horizontal situation indicator (HSI). 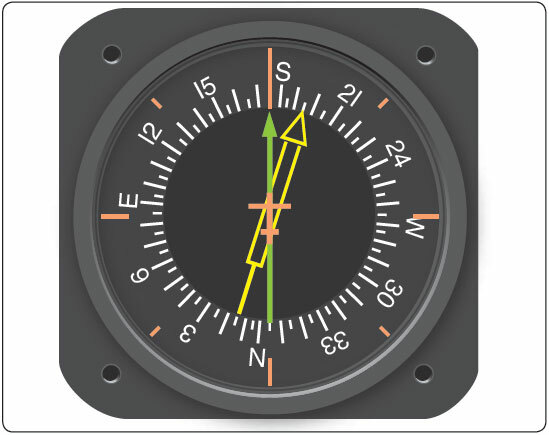 Remote indicating compasses were developed to compensate for the errors and limitations of the older type of heading indicators. 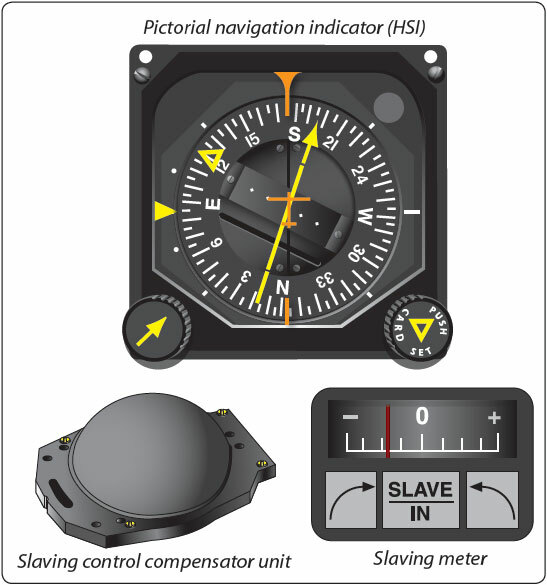 The two panel-mounted components of a typical system are the pictorial navigation indicator and the slaving control and compensator unit. [Figure 5-25] The pictorial navigation indicator is commonly referred to as an HSI. Figure 5-25. The pictorial navigation indicator is commonly referred to as an HSI. The slaving control and compensator unit has a pushbutton that provides a means of selecting either the “slaved gyro” or “free gyro” mode. This unit also has a slaving meter and two manual heading-drive buttons. The slaving meter indicates the difference between the displayed heading and the magnetic heading. 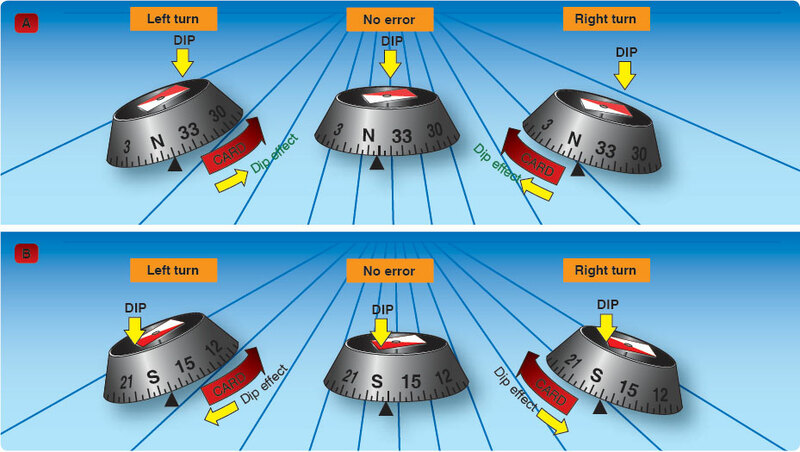 A right deflection indicates a clockwise error of the compass card; a left deflection indicates a counterclockwise error. Whenever the aircraft is in a turn and the card rotates, the slaving meter shows a full deflection to one side or the other. When the system is in “free gyro” mode, the compass card may be adjusted by depressing the appropriate heading-drive button. 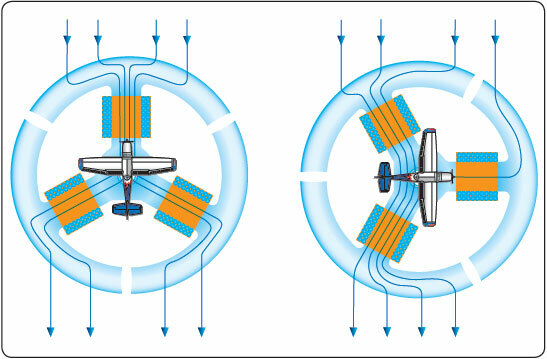 A separate unit, the magnetic slaving transmitter is mounted remotely; usually in a wingtip to eliminate the possibility of magnetic interference. It contains the flux valve, which is the direction-sensing device of the system. A concentration of lines of magnetic force, after being amplified, becomes a signal relayed to the heading indicator unit, which is also remotely mounted. This signal operates a torque motor in the heading indicator unit that processes the gyro unit until it is aligned with the transmitter signal. The magnetic slaving transmitter is connected electrically to the HSI. As instrument panels become more crowded and the pilot’s available scan time is reduced by a heavier flight deck workload, instrument manufacturers have worked toward combining instruments. One good example of this is the RMI in Figure 5-26. The compass card is driven by signals from the flux valve, and the two pointers are driven by an automatic direction finder (ADF) and a very high frequency omnidirectional range (VOR). Figure 5-26. 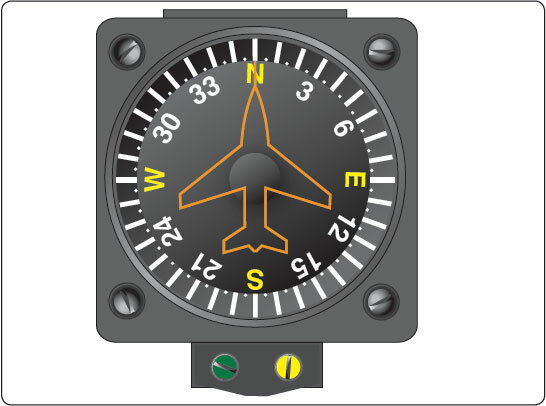 Driven by signals from a flux valve, the compass card in this RMI indicates the heading of the aircraft opposite the upper center index mark. The green pointer is driven by the ADF. The yellow pointer is driven by the VOR receiver.